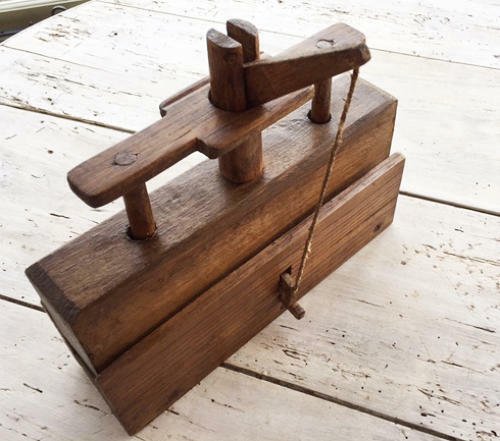 Antique Norfolk Deadfall Mousetrap made of Oak circa 1900. To set it you pulled the arm down and this is held in place by attaching the wooden catch to the foot at the base of the trap. This in turn raises a trip plate inside. When the mouse runs through the tunnel, treads on the plate it sets off the trap and the heavy block says bye bye to mouse! These were typical to this area of Norfolk and often home made.